The first 45 minute S & F turned into more like 1 hr and 45 mins. C'est tout et bonne journée. Read more about 1st Bake in 2 YEARS!! So the past few attempts at my sourdough boule were a flop. A conglomeration of under-proofing, crappy shaping, sticking to the brotform were to blame. So I took a look at the recipe again I decided to make some big changes from the original. Couldn't help but taste it. 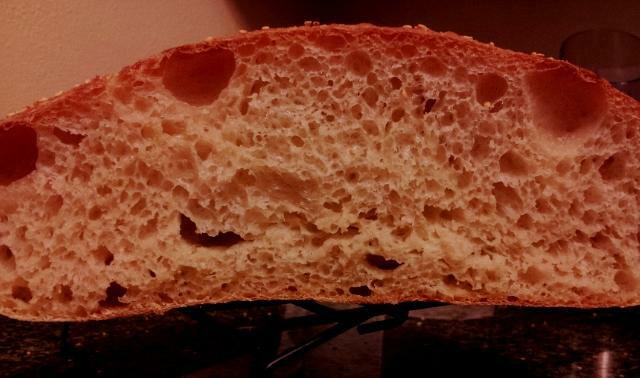 Softest and creamest crumb to-date! So I let it proof (the final type) at room temp for 8 hrs because I didn't have a choice(work). With my last recipe that would have been no problem but when I returned home this sucker was almost 2 inches above my 8 1/2 inch brotform! I thought for sure overproofed. It was giggly but passing the poke test. 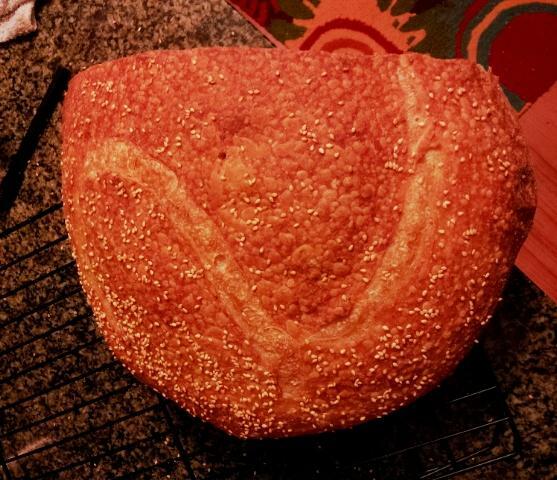 So i flipped it onto the baking parchment and suprisingly it didn't deflate, and it came out of the brotform effortlessly due to the rice flour (thanks Ian). This boule was huge! At least 12 inches in diameter if not a bit more. 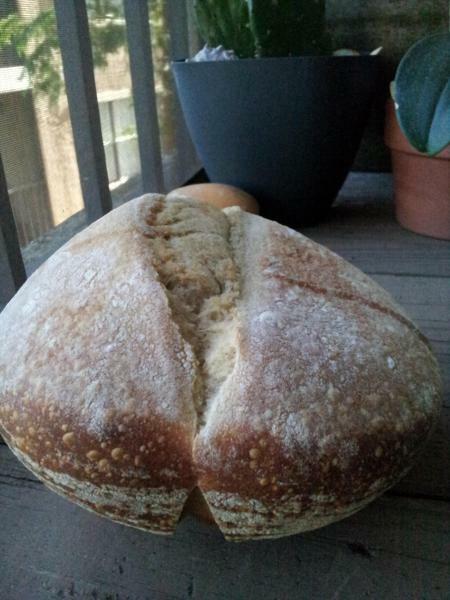 I have never baked a miche but from the pics I've seen my loaf more resembled a miche than a boule (in size anyways). Scared to score it deep, I scored my first name intial L very shallow, plus I figured it wouldn't rise much. And in it went. Out of the oven I could not have been more pleased! Awesome soft and creamy crumb with a thin crunchy crust. Awesome tang, the most yet! Now that I know the proofing time is faster I will plan for that to get a handle on how big it actually gets. But that will have to wait at least 3 months. Thanks TFLer's for all your help! 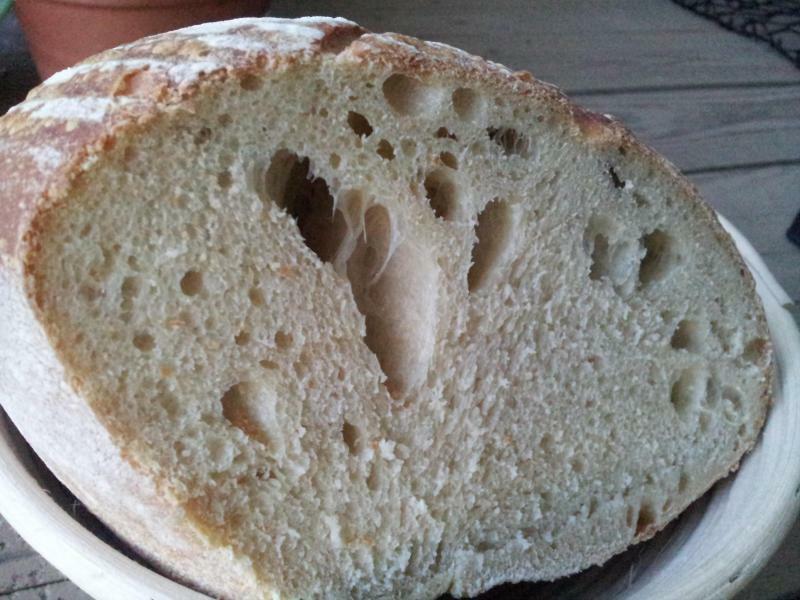 Read more about Sourdough Boule No. 4 Success! OK, so I came up with a general recipe last night that would scare the socks off even the meanst ghoul. I need some input though. It's going to be a zombie bread. I want to make a sourdough with a mix of AP and Whole Wheat and, the best part, I want to use squid ink as part of the hydration percent to color the loaf black and add pistachios and cranberries for color and flavor. The thing with squid ink is that it is salty so I'm trying to figure that part out. First go-around with Epi's and Fougasse, so critique but be kind. 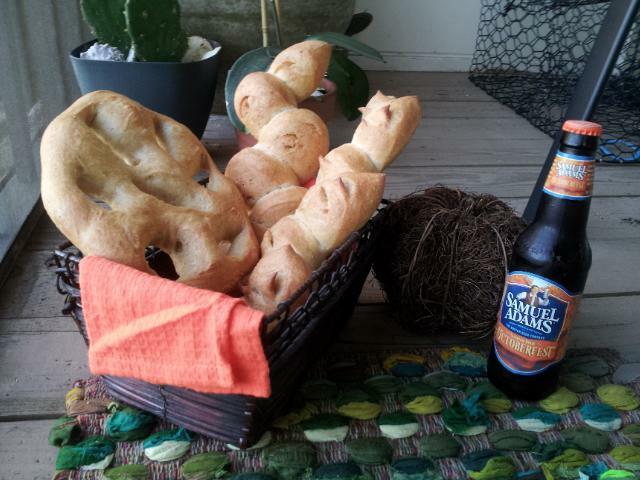 Just messin...they are all the Pain de Campagne recipe from BBA. 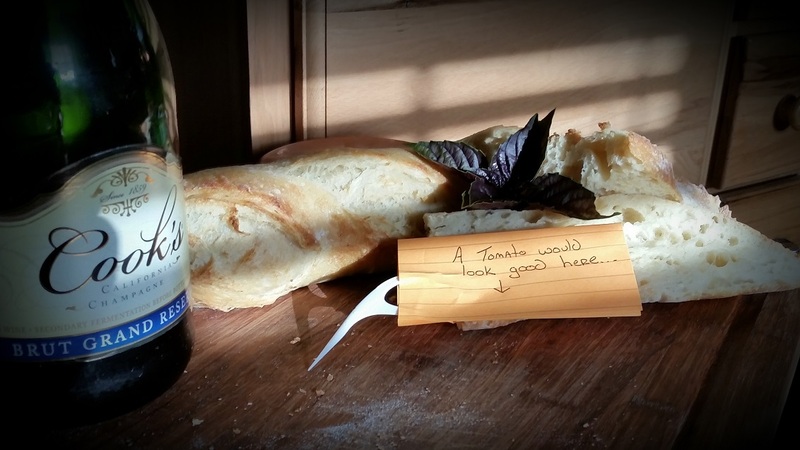 Absolutely delicious bread! 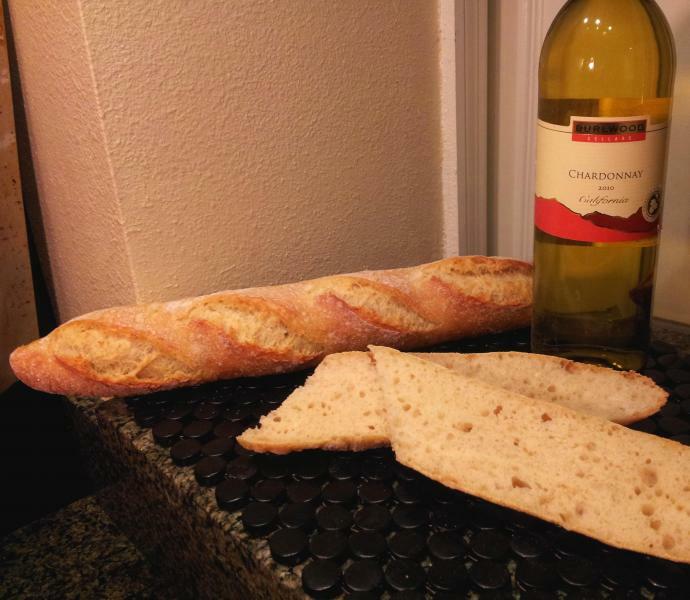 By the way, almost all of that bread is gone...ah, fresh bread...can't be beat! Ok, I'm officially frustrated. My first boule turned out pretty good, thought maybe just the shaping needed some work. Since then my past two sourdough boules have gone haywire and here are the results of this weekend's bake. Looks decent from the outside but just wait.. I follow the original recipe found here. 21h 10m in the fridge for the cold autolyse with a flip after 12 hours. I let the dough sit in the brotform for 2 hours after shaping and before storing in the fridge for 24h 40m. Let the dough proof for 8 hours. Used a 1/2 cup of water for steam instead of 1 cup. All the temps were nearly the same. The crust was thin but crunchy and the crumb was creamy and fantastic! I swear it almost had a hint of butter. My girlfriend actually woke up at 6 am when they came out of the oven, grabbed half a baguette, muttered delicious and went back to bed. I laughed. Any comments or critiques feel free! Amazing the difference between the 12 and 24 hr cold autolyse. 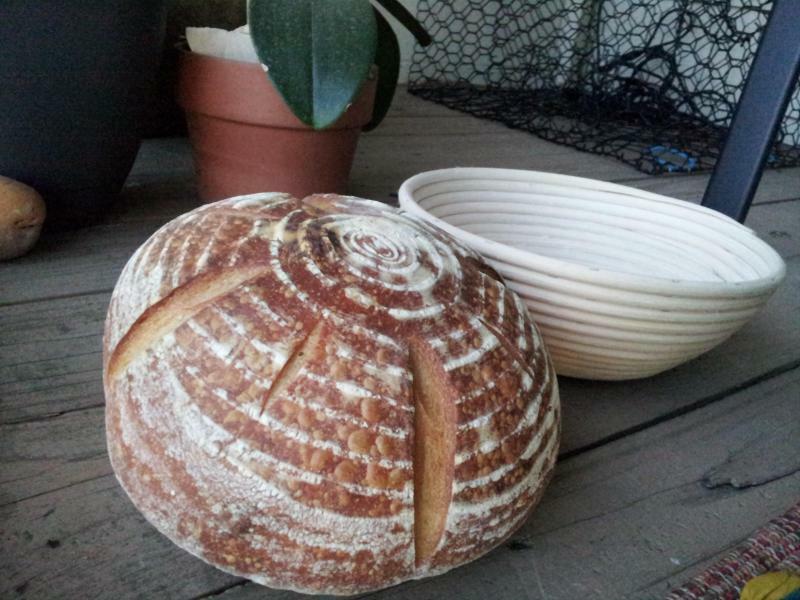 Yeah, those are the best two words to describe this weekend's sourdough boule. I prefer to embarrass myself on accident, hence no pictures. I guess every baker is entitled to a few mishaps here and there. I'll get to the points of where I went wrong. Instead of 4 S&F w/30 min in between, I felt bold and thought 2 S&F w/ 45 in between would be enough and it might have had I not waited 30 min to shape after final S&F, which caused a lot of bubbles at the surface, which then caused burns spots. Well almost burned. Then in final proof it didnt seem like the dough was rising so I proofed for 8hr, and then 1 hour in the microwave with a cup of hot water at 90F. The what would be bottom seemed to develop a thicker skin this time, so maybe that hindered proper rising. To top it all of the son-of-a-wheatfield stuck to the brotform and ripped and deflated a good amount by the time I was ready for the oven. 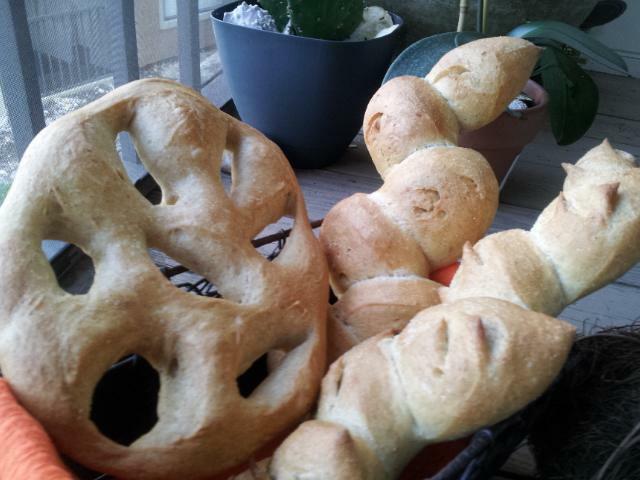 I like the flour lines but jeez, I wont spare any flour next time and just brush it off once out of the brotform. I really don't feel like wasting another 48 hours of work. Oh and 1/2 cup of steam instead of 1 cup. So because of the brotform fiasco and the tougher bottom skin the loaf baked like a giant popover almost. Scoring needed to be deeper too. All-in-all it turned out to be a good learning what-not-to-do experience. 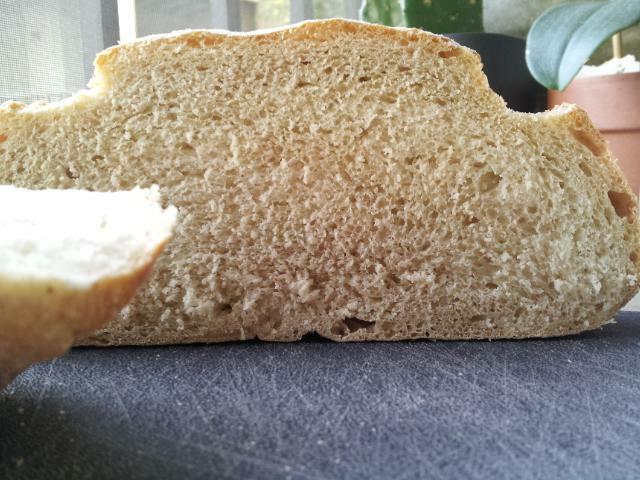 Since the ingredients were right, and even though the bread was dense, it was soft and still tasty. I challenge you to yet another duel you boule! With all that discard starter I just couldn't help but send it to the griddle. I followed kjknits recipe, except I let it sit out for 14 hours and in the fridge for 2 hr. I had to make a trip the farmers market. My palate couldn't complain. 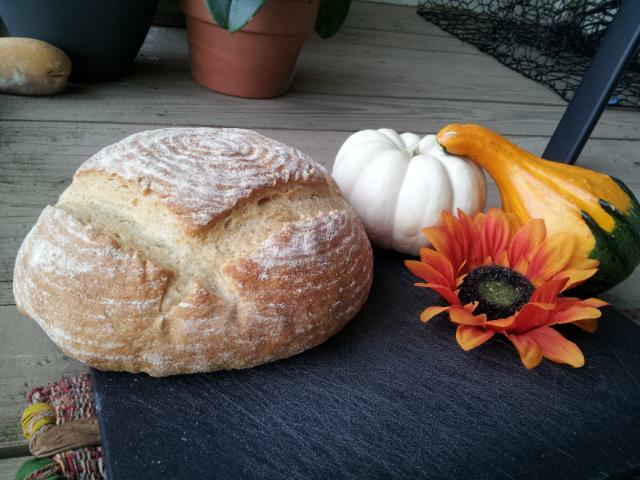 So amidst my Baguette a l'Ancienne and Sourdough Boule baking frenzy I began feeling a little wheaty. I decided to bake again, 3rd time, Peter Reinhart's Whole Wheat recipe in The Bread Baker's Apprentice. First two attempts were...eh...not so good. Basically negative rise accompanied by an Adamantium-like density. So being a little discourage I did what anyone would do, I tried again. Forgive me for switching back and forth between ounces and gram, but I have no second decimal for ounces. Sat out for 41/2, then in the fridge for 21hr 40min. Sat out for hour to take off chill. Dough temp was at 78.1F after kneading. Bulk fermented for 75 mins, shaped into sandwich loaf via Khalid's method, then final proof for 45 min. Preheated to 400F, then placed loaf in (9x5 loaf pan) oven and reduced to 350F for 30min, rotated 180 degrees, bake for another 15min. Cooled for approx. 2 hrs. Turned out great in my opinion. No grassy after taste and soft inside. Anybody want to critique feel free please!